My eyes droop wearily as I step through the doors and out of Edmonton International Airport, Canada, the past 20 hours a blur of flights, transfers and rubbery airport food. My first lungful of -30°C air is like a knife in my chest, and I pull the collar of my jacket close to my neck as I trudge across the car park. Waiting for me is the enormous Ford Flex that will carry my girlfriend Lilly and me from the city of Edmonton through the wilds of the Canadian Rockies over the next week, taking in the province of Alberta's spectacular scenery and largely unhospitable weather in the process. Lilly slides into the Flex's cab and cranks the heating up to full, and we watch the frost slowly melt off the windscreen before setting off towards Edmonton. The sheer scale of this land hits us straight away; six-lane motorways, roads lined with fast-food chains, and lorries the size of small houses that rumble by as we make our way through the industrial outskirts of the city. Building, built in 1913 and the only reference to the city's age. Within minutes we're pulling onto the plethora of cycling, running and cross-country skiing tracks that line the banks of the North Saskatchewan River that flows through the city. Chris explains that Edmonton residents, for the most part, thrive on the easy access to nature, and from the number of joggers, cross-country skiers and cyclists out at this early time, this analysis appears true. Chris takes us further along the river and shows us the Edmonton ice castles, a man-made series of ice walls and roofs constructed out of hundreds of icicles, with numerous tunnels, slides, thrones and walkways; a phenomenal place to behold, and one that attracts people in their thousands. The sun soon starts to dwindle, snow heavily plummets from the sky, and we hurriedly return our fat bikes and clamber into the Ford; Jasper is calling. Rolling slowly onto the Trans-Canada Highway, the Ford struggles to find grip on the ice beneath it. A howling wind hurls powder from the never-ending snowstorm across the windscreen, momentarily blocking my view of the road ahead, and in the distance I can just make out the jagged shape of a looming mountain. As I drive through Jasper National Park, in the heart of the Rocky Mountains, the car teeters on the verge of safety; there's little to differentiate the road from the wilderness in the near-complete whiteout, but I drive onwards with exhilaration. There's a certain charm to feeling on edge. Lilly yawns – the cold and jet lag are taking their toll – and the gentle glow of Jasper is a welcome sight. We crawl along Connaught Drive, the main road through the town, and pass an array of '90s-style outdoor stores, whose steps are adorned with wood-carved grizzly bears and miniature totem poles, and whose windows are cluttered with snowshoes, winter jackets and skis. It's as if we've stepped back 25 years. We carefully park amid 4x4s that dwarf our Ford, and from the journey in, it's clear why vehicles of this size are needed. Our stomachs growl and we settle for dinner in North Face Pizza. As we enter, an ice hockey game flickers on an ancient television, the eyes of the locals within transfixed on the screen before them. Lilly and I exchange a glance in surprise at the small town feel of this place. At our hotel the following morning, I ask a young German waitress why she chose to live in Jasper. "For the access to the outdoors," she says, "I love nature, and Jasper is the place for it." In daylight, Jasper is even smaller than I thought, and even more stuck in time. But I like this; I like the remoteness and the feeling of insignificance when surrounded by the Rockies. I also like the proximity to wilderness activities, and I understand the German waitress immediately. Later that afternoon, a herd of elk ventures down from the surrounding mountains to parade along the high street. It's magnificent, and again shows the quiet nature of this small town. Over the next few days, we fully explore Jasper's outdoor pursuits. 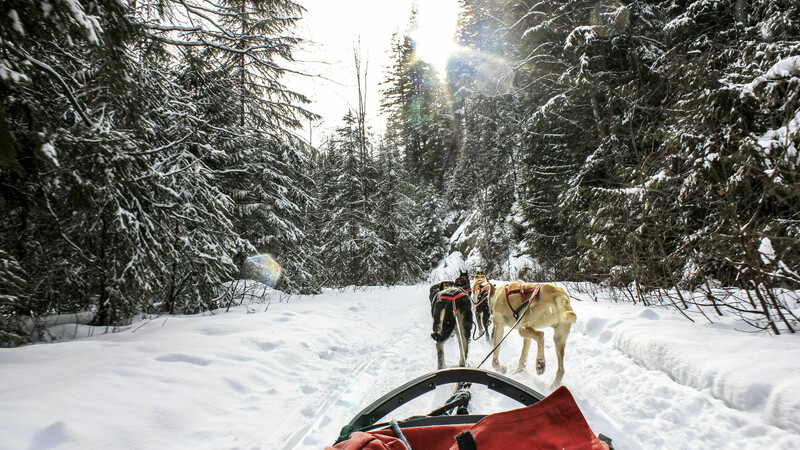 We partake in an afternoon of dog-sledding; there's something intensely charming about being pulled through the silent white wilderness by eight hounds, where all that can be heard is the gentle glide of the sledge. We ski at the nearby Marmot Basin; I have never once skied on such perfect powder snow, and even deep into the afternoon, the snow remains like icing sugar beneath my skis. 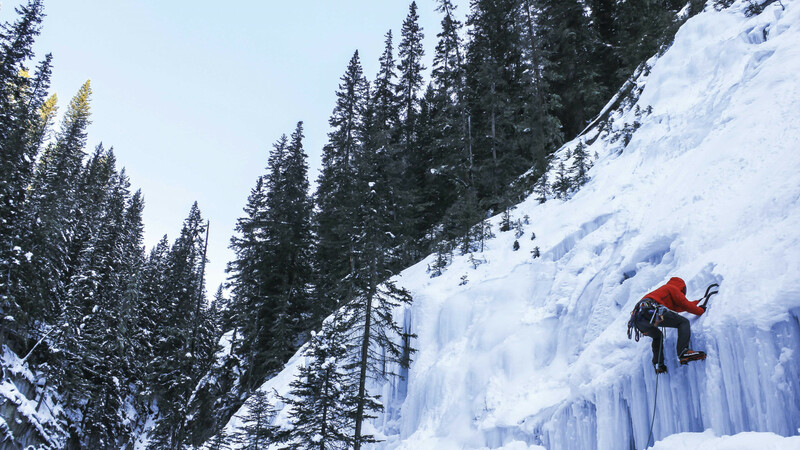 We also join the Maligne Canyon Icewalk for a late-night trek into the ice-coated gorge, lit only by our head torches. The ice creaks and crunches, and the limited light creates flickering shadows. It's as if the canyon is moving to the beat of our step. "This place is magical at night," says our guide, Chris Krupski, "The ice feels alive." Back in the Ford, we leave Jasper and head towards Banff, some 180 miles south along the Icefields Parkway. However, as with most journeys, nothing ever goes to plan. After a heavy blizzard overnight, part of the Icefields Parkway has been closed due to a severe avalanche risk, which means we must drive around the Rocky Mountains and join back up with it 100 miles further along. We look at the map; it's a 400-mile detour. And so we leave the beauty of the Rockies and tirelessly plough along the Cowboy Trail for almost six hours, with nothing but grey skies, frozen farmland, and the permanent shadow of the Rockies teasing us to our right. Eventually pulling back onto the empty Icefields Parkway, the road is thick with powder that's not been cleared. The wheels of the Ford spin wildly and I grip the steering wheel hard in order to stay on the road. It's both terrifying and thrilling. Mountain peaks penetrate the horizon like a sea of blades, the frozen lakes glisten in the now-bright afternoon sunlight, and snow-covered pines sway in the erratic breeze. The driving is arduous and, if not for Lilly, achingly lonely. It feels as if you're stuck, isolated, in the remotest corner of the world. Everything changes sharply when you get to Banff: the streets bustle with people, designer stores adorn every street corner, and from the architecture, it's obvious that this is a wealthy town. 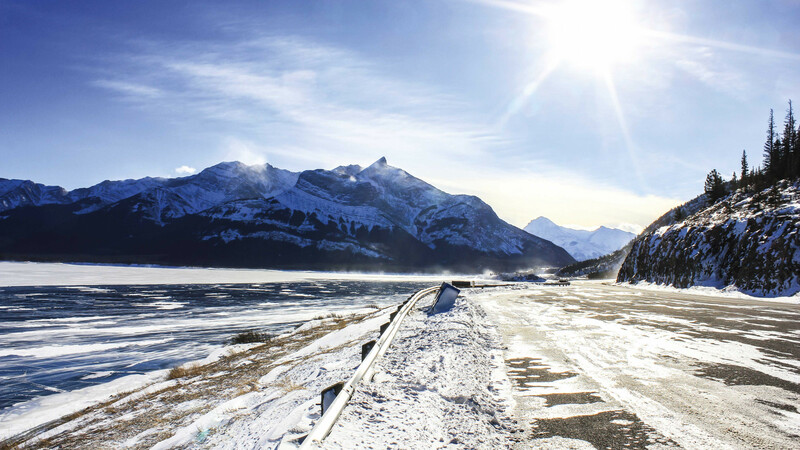 Strolling along Banff Avenue, it feels as if you're in the Alps, maybe Verbier or Val d'Isère, and while I don't dislike the upmarket atmosphere, I far preferred the remoteness of Jasper. However, I soon discover that Banff National Park hosts some of the finest winter activities in the Rockies; 3,000 acres of skiable terrain at Sunshine Village; the smaller ski resort of Mount Norquay, ; and the entirety of Johnston Canyon, the centre of Rocky Mountain ice climbing. Driving deep into Banff National Park, the sun lies low on the horizon. We are alone on the road. Lilly hollers excitedly; to our right, a bull elk clambers solemnly up a steep bank, momentarily piercing us with his gaze. We pull into Johnston Canyon car park and meet Jess De Montigny, our guide, and follow him into the gorge. Partway up, Jesse looks at the near-vertical ravine walls. 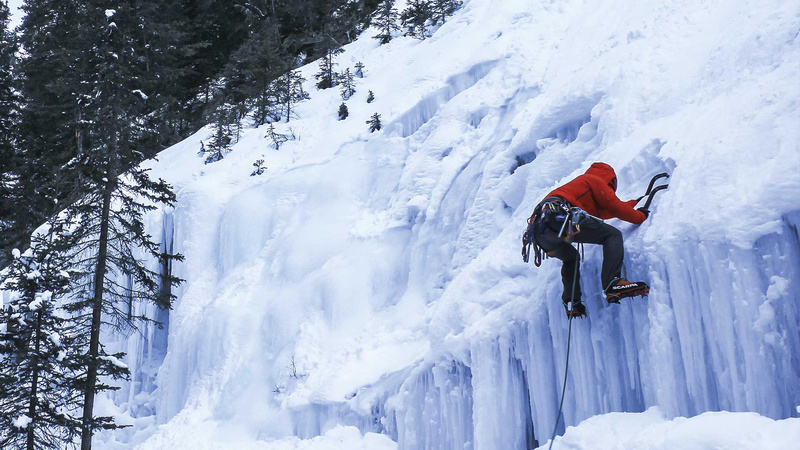 "This ice looks good," he says, pointing across the gorge, "you'll get a good feel for ice climbing here." Lilly nudges me. "What have we got ourselves into?" she says hesitantly. Crampons on, belays and ice axes ready, we take it in turns to ascend the ice. My adrenaline pumps and I breathe hard. Looking down, with nothing but a sheet of ice and air between me and certain death, I smile in both excitement and fear of the unknown. This is what a winter road trip offers; excitement and fear in equal measure. The very nature of any journey pivots on the unfamiliar, and the Canadian Rockies are that very obtainable unknown.